Every year, thousands of children go missing. The FBI's new Child ID App can help. Safe Kids North Carolina is partnering with the FBI to help spread the word about this free mobile application that can assist your family should your child go missing. Developed by the FBI, the Child ID app provides a convenient place to electronically store photos and vital information about your child so that it's literally right at hand if you need it. Show your child's picture and provide physical identifiers, such as height and weight, to security or police officers on the spot. Quickly and easily email your child's identifying information to authorities with a few clicks. View specific guidance about what to do in those first few crucial hours after a child goes missing. 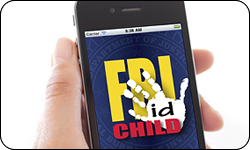 Click here to download the free FBI Child ID App via iTunes for your iPhone or via GooglePlay for your Android. We encourage you to spread the word about this app with family and friends. For more information about this new mobile application, please see the FBI's Child ID App web page. An important note: Neither the FBI, iTunes nor Google Play are collecting or storing any photos or information that you enter in the app. All data resides solely on your mobile device unless you need to send it to authorities. Please read your mobile provider's terms of service for information about the security of applications stored on your device.